Their stories were the same. While skating the streets of Van Nuys a man approached them. He called himself Low-Key, the Trickster from Woodley Park. He dressed all in green and he told them stories about epic bouts between teams of fearless skaters. He talked about star passes, apex jumps, and massive hits. When they were hooked, he introduced them to the others. Soon they were all skating together, rampaging up and down Sepulveda Boulevard, Sherman Way, and Victory Boulevard. One night at Pedlow Skatepark, while they skated around in an ever faster circle, a blond surfer dude appeared and began to fight with Low-Key. Suddenly the stranger whipped out a massive hammer and slammed the ground with it. Lightning struck repeatedly, more times than anyone could count. By the time the blinding flashes had ceased, both men had disappeared. At first no one knew what had happened. But something had changed in all of them. They had been transformed. No longer were these women mere mortals. They were now a pack of fey beings, their fierceness matched only by their strength. Their wings unfurled and they took their rightful place in Midgard as the Valkyries of Van Nuys. Drawn by the fierce roller derby battles at The Lot, the Valkyries flew in from the East and descended upon the track. These winged women are now ready to claim the souls of the fiercest warrior skaters that the Balboa Bandits, Reseda Wreckers, and Topanga Maulrats have to offer and take them to Valhalla. 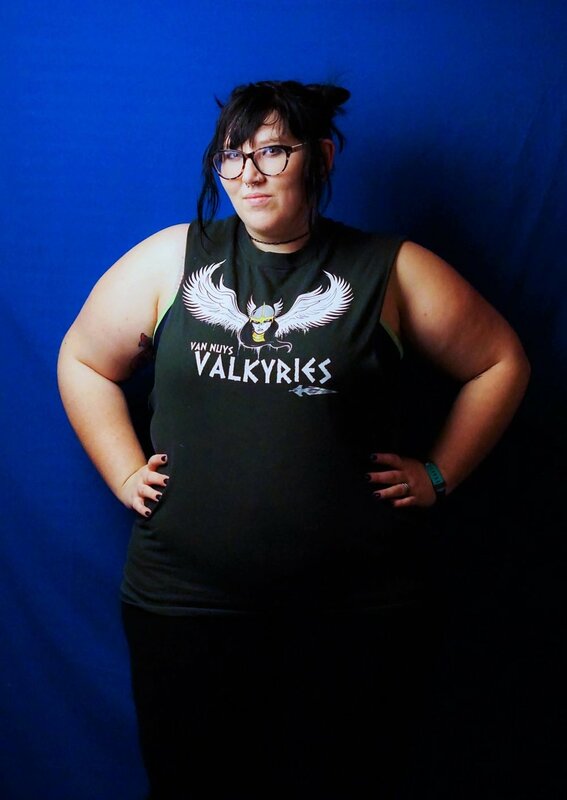 Meet the Van Nuys Valkyries!